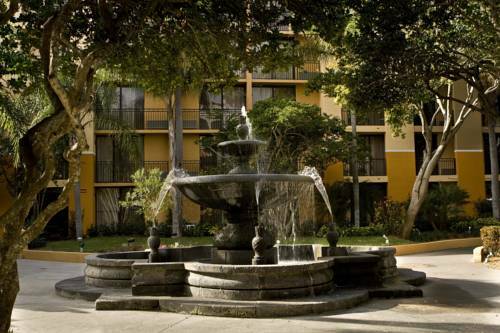 Embark on memorable travels at Courtyard Bradenton Sarasota/Riverfront. We are one of the top waterfront hotels in Bradenton, FL located on Manatee Riverwalk, providing guests with a picturesque location surrounded by a host of destinations. Visit the City of Palmetto, Bradenton Area Convention Center and Manatee Memorial Hospital. After your outing, settle into comfort at in our rooms and suites, featuring balconies and river views. We have luxurious bedding, free Wi-Fi and flat-panel TVs. Start your mornings the right way by indulging in a delectable breakfast and Starbucks coffee served at our on-site restaurant. The Bistro also serves dinner options and handcrafted cocktails. Need to host an event? We boast over 6,000 square feet of event space as well as catering options for your wedding reception or business convention. During downtime, have an energizing workout at our outdoor pool and 24-hour fitness center or enjoy the riverwalk. Whatever brings you to our hotel, enjoy your stay. The Bistro - Eat. Drink. Connect. : Your food and beverage destination for refreshing breakfast choices in the morning and a variety of dinner and cocktail options in the evening. The Bistro also offers specialty beverages made with Starbucks coffee to help you get a jump on the day.